I always tell speakers that an audience will forgive them for a lot of mistakes when it comes to websites. People will forgive you the occasional glitch like a typo or a dead link here and there. One thing that is borderline impossible to overcome, though, is when site visitors don’t understand what it is that you do. When we come across something that we can’t immediately “get”, we’re not likely to hang around. Feel free to blame social media and all its dings and chimes for our hummingbird-like attention span. My point is this: You have a brief window to let someone “understand” you, and if you miss that window, you’re unlikely to get a second crack at it. To complicate matters, your website has to represent you without the benefit of you physically being there to clear up any confusion. I’ve come up with a test to see if your website is accurately doing its job when describing what it is you do. The good news? It’s a really simple test. The first step is to find someone who barely knows you or doesn’t know you at all. If you get your mom, your best friend, or your spouse to do this, it’s not going to work. Next, show them your website. You can do it over Skype, or in person with your laptop or phone. The catch is this, you’re only going to show them the site for 10 seconds. At 10 seconds, you snap the laptop shut. Trim the fat. Look for potentially extraneous information that does little to help your cause, then cut it loose. The less info there is to process, the easier it will be for someone to understand the content. Focus on the big text. Your headers are what people quickly scan when they’re looking over your site. Try making them easily digestible and to the point. Be explicit instead of cute. It’s cool when you can come up with a clever and pithy headline for your site, but it’s not going to do you much good if no one knows what you’re talking about. At the end of the day, “I help companies deal with change” is better than “Helping ships traverse oceans of uncertainty”. Make it clear, then worry about making it clever. Revisit your promise statement. Your promise statement should, in no uncertain terms, tell the world “this is what I do and this is who I do it for.” This is the lynchpin of your brand. If you can articulate a promise statement, you’ll be amazed at how fast the rest of your brand falls into place. I want to leave you with this call to action. If you put your site through the test, what were the results? Were they what you had hoped for? 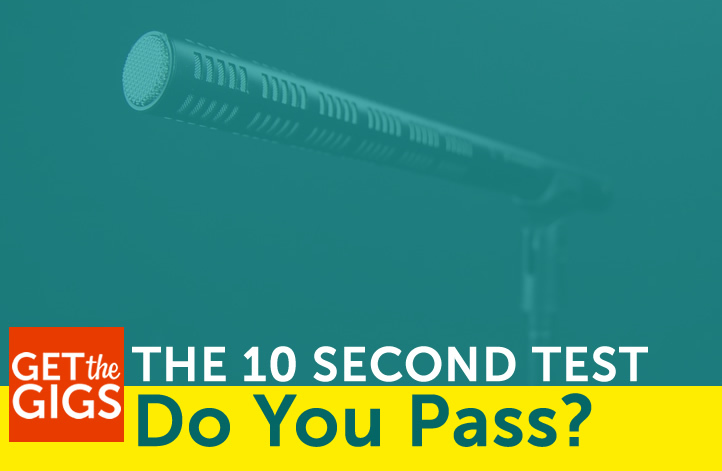 And, if you can’t wrangle up someone to give you their 10-second take, I’ll do it (for free). Just shoot me an email at derek@getthegigs.com. I can’t wait to hear how this test goes for you. Better Branding: Play Yourself In The Lead Role! WordPress For Speakers: A Perfect Fit!